On March 19, the Arlington County Board honored 31 local businesses and properties for their dedication to sustainable transportation for employees and tenants, as part of Arlington Transportation Partners’ (ATP) Champions program. The program—which celebrated its fifth year in 2018—is supported by Arlington County Commuter Services (ACCS). The program motivates businesses, multi-family residential communities, commercial properties, hotels, and schools to recognize the impact they can make to reduce traffic congestion in Arlington County. The 31 Platinum Level Champions are companies in Arlington that have made a financial and cultural commitment to implementing transportation initiatives and programs. These Champions value a balanced corporate culture, including improved employee benefits, sustainability and a better work/life balance. Earlier this year, all participating businesses were honored at the annual banquet, which featured Arlington County Chair Christian Dorsey, Director of Transportation Dennis Leach and keynote speaker Michael Kodransky from The Institute for Transportation and Development Policy. The event also celebrated the fifth anniversary of the Champions program, and recognized the organizations, businesses, employers, and residential properties that have participated since the inaugural year, as well as the Arlington Partnership for Affordable Housing (APAH) for its commitment to ensuring Arlington residents have access to affordable means of transportation. Champions 2019 has already started, and ATP will challenge all Champions to take their commitment even further and provide tangible programs that encourage employees, residents, and tenants to try more sustainable transportation options. Learn more about the Champions program. 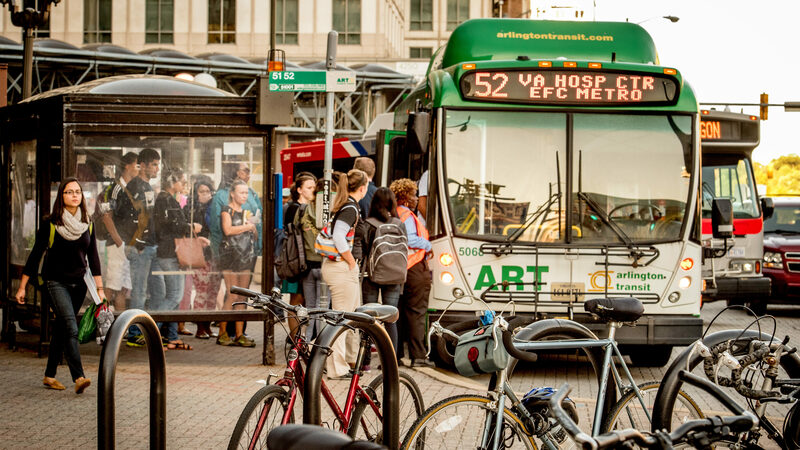 Champions is a program that recognize businesses, residential properties, commercial properties and schools in Arlington County that show a commitment to encouraging the use of sustainable transportation modes such as public transit, ridesharing, biking and walking. Formerly called Workplace Commute Champions, Champions began as a pilot for employers only in 2013, and officially launched in 2014. More than 240 companies are enrolled including corporations, trade associations, governmental agencies and universities.